Do you have any rituals when you are writing? Are you a late night or an early morning writer? Late night, for sure. I’ve always been a huge night owl. In my perfect world, days would start at 4 pm and end at dawn. Would you delve into a different genre? Is there a genre you really want to write in? I am absolutely willing to dive into anything, but so far, my ideas have mostly been of a similar genre. Some day, I imagine that I’ll write a horror novel or a contemporary YA. Synopsis: The Carnival is all she's ever known - but an old terror could tear it down. What I Thought: I absolutely love anything to do with the circus, so I just knew I had to read this one. 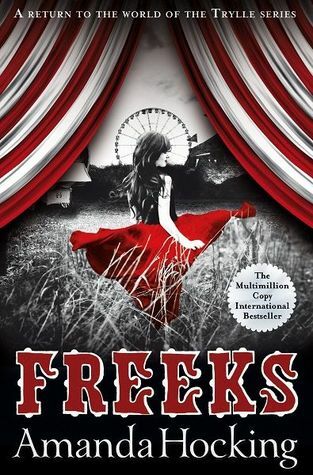 I have read only a couple of Amanda Hocking's other books, which I quite enjoyed, so I was happy when I discovered I liked this one just as much. I love that it is set in the past. I love that is has a paranormal feel. I love that it was so easy to read. The characters were lovable. The storyline was lovable, however it quite cliche. When a story line is cliche, it can take away from the depth of the novel. Nevertheless, I really enjoyed it.